Outfit: Wedding season has arrived…Flower power! 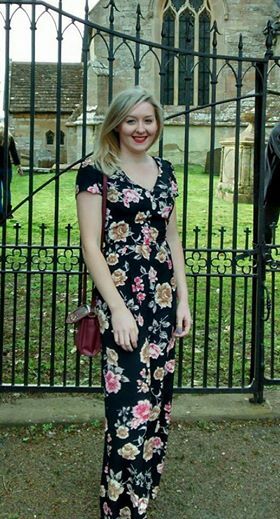 I went to a wedding at the weekend and this was my outfit…. It’s the first of a few I’m attending this year and I’d told myself that I would NOT buy a new dress (I’m trying to save for a house deposit this year). Technically, I stuck to that ruling. I saw this floral jumpsuit in Miss Selfridge a month ago and was smitten. I’m a big fan of playsuits (I have two at the moment) but this is my first jumpsuit. I couldn’t wait to call my mum after I’d bought it – she had some great jumpsuits back in the 70s, although they were much more utilitarian in style. She gave me a useful tip re bathroom visits: take the whole jumpsuit off and hang it up so that it doesn’t drag on the floor! To keep it simple, I wore black heels and a black blazer when it got a bit chilly. I did throw in a few colour pops though: my favourite orangey-red lipstick, bright green stud earrings and bright blue nails. As it was quite a formal wedding I probably stuck out a bit among the dresses – I got lots of compliments though which was very flattering. The jumpsuit will have it’s second outing for another wedding in a month’s time! ← What is there to know about me?